4allmemory, at 4allmemory.com, is your treasure trove for computer memory. Upgrade your computer’s memory with 4allmemory, which carries memory for all models. In addition, 4allmemory offers hard drives, flash media, cables, video cards, and computer components. 4allmemory ensures the quality of its products with a lifetime replacement warranty on all computer memory. Check to see what upgrades your computer needs on 4allmemory.com, and consult RetailSteal.com for 4allmemory coupon codes, 4allmemory discounts, and 4allmemory promotions. Free FedEx Ground shipping on memory orders more than $400, and USPS memory orders less than 13oz and less than $400. Free shipping rate only available for memory orders. 30-day money back guarantee on unopened products. Check website for full details, exclusions may apply. Head over to 4AllMemory and use our coupon code online today to save $5 on purchases of $100 or more. 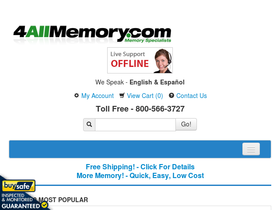 Save 5% on all orders from 4AllMemory - click to shop and use coupon code to save. Shop online at 4AllMemory.com and enjoy free shipping on computer memory upgrades. Click to save. Save up to $30 on select video cards at 4AllMemory. Click link for savings. Find quality memory for your MacBook and MacBook Pro, at a fraction of the price at 4AllMemory. Click link to save. For all items at 4allmemory enjoy a free limited time warranty. Check out ESET's Smart Security for free with this link. Click now.